This walkthrough is meant as a general guide only. It may not include every pickup or secret. There may also be alternative ways of approaching situations within the game. The level begins at the bottom of a large mountain range. Run forward and take a running jump up to the small stone structure ahead. Arm weapons and shoot the 2 warthogs running about. Climb the ledge and the block above and face west. Take a running jump to the sloped tile. Jump up and grab the slope above and shimmy right as far as you can. Pull up, angle to face north/east and take a standing jump to the column ahead. Face west and take a standing jump and grab the slope. Shimmy right until you can pull up. Turn right (north) and take a running jump to land on the flat block ahead. Face south, jump back and grab the ladder on the inner side of the column and climb down. Jump up and grab the jump switch and climb back out. Take a standing jump to the slope and slide back down to the valley floor. Head to the small stone structure and drop into the alcove in the floor. Pickup the flares and enter the darkened corridor. Head down the corridor, turn left and drop down. Lower into the crawlspace, reverse roll and climb into the next crawlspace. Crawl through, stand up and lower into the next crawlspace on the left. Drop down into the next corridor. Turn right (south), climb the block and crawl into the crawlspace ahead. Pickup the Pharos Knot and exit. Head north, turn right and drop down. Move ahead, drop down and turn right. 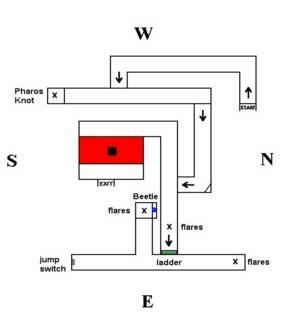 Turn left, pickup the flares and climb the ladder (the wall ahead is climbable). At the top, turn left, climb into the crawlspace and lower out the other end. Pickup the flares and exit. Head south, enter crawlspace. Jump up and grab jump switch, watch a cutscene of a block raising in another room and exit. Return to the ladder, climb down and head west. Turn left, crawl through the crawlspace and enter a red lava room. Take a running jump and grab the block in the middle of the lava pit. Take another running jump and grab to the other side and exit via the door in the east wall. Climb the blocks on the west side to the top and place the Pharos Knot in the wall receptacle near the gold doors. Enter through the newly opened doors and dive into the water. Pickup the Shotgun and pull out. Shoot the chests around the perimeter and pickup 3 Shotgun ammo enclosed within. Climb the stairs, pickup the small medipack and enter the fortress. Follow the corridor right and turn left at the first alcove. Arm weapons, shoot the bat and pickup the Shotgun ammo. Exit the alcove and turn left. Head down the corridor, turn left and climb the wooden stairs. Turn left at the top and then right. Enter the room on the left and pickup the Crowbar on the raised block. Exit the room, timed to avoid the blades that are now active and turn right. Turn left and head north to the end of the corridor. Secret #1: Head towards the darkened alcove in the north wall and arm weapons. Shoot guns to see and turn right. Shoot the bat and drop into a hole in the floor. Crawl through the crawlspace, into Secret #1. Pickup the Crossbow ammo, large medipack and Shotgun ammo in two corners of the room. Open the sarcophagus and pickup the Crossbow and exit through the crawlspace. Climb the block, head through the corridor and turn left back into the maze. Follow the right wall and take a standing jump west over the gap. Follow the right wall and take running jump and grab west over another gap. 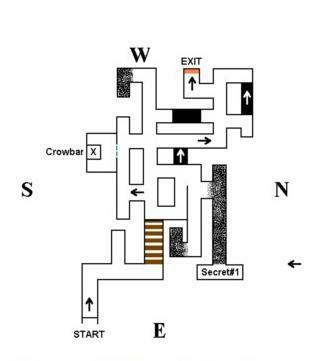 Follow the right wall and take out the skeleton with explosive crossbow ammo, that is if you went for Secret #1. If not, then return to the gap and shoot him into the abyss with the shotgun. Open the door with the crowbar and watch a cutscene of the next area. Take a standing jump to the ledge ahead. Angle to face south/east and take a standing jump and grab the reddish foliage on the wall (it is climbable). Climb to the lower ledge and take a running jump and grab to the next ledge. Arm weapons and take out the 2 golden harpies. Enter the corridor and use the crowbar to open the door. Shoot the chest and pickup the Shotgun ammo in the south/west corner. Climb the bookcase and jump up and grab the ladder on the inner north wall of the hole in the ceiling. Pull up at the top and jump up and grab the jump switch on the wall. Watch a cutscene of a block raising somewhere. Climb back down the ladder, exit the room back to the ledge outside and dive into the mossy pool below. Pull up out of the water and descend the stairs in the north wall. Shoot the chests in the north/east and south/east corners and pickup the large medipack and Shotgun ammo. Jump up and grab the jump switch in the east wall and watch a cutscene of a door opening in the pool outside. Climb the stairs out and drop into the pool. Swim down into the hole in the floor and follow the corridor south, then right. Follow the left wall around and swim through the opening in the north wall. Swim right, follow the left wall around and swim into an opening in the south wall. Swim right, follow the left wall around until you reach a hole in the ceiling and swim up. Swim north, then right (east) and follow the corridor until you reach an air hole in the east wall. Secret #2: Face north and swim to the end of the corridor and turn left. Follow the corridor around and up to surface into Secret #2. Pickup the small medipack and 2 Shotgun ammo in three corners of the room. Drop back into the water and follow the corridor right, eventually facing south back to the air hole. Facing south, swim forward, to the right and up to surface in a darkened room. Pull out of the water, climb the block at the west wall and use the crowbar to pry off the Black Beetle. Immediately jump up and grab the monkey swing above as a swarm of beetles emerge from the hole in the wall. Turn around and swing forward, then left into an alcove in the north wall. Run through the blades and pickup the Winding Key inside the sarcophagus. Turn left and pickup the Shotgun ammo in the alcove on the left. Exit the room, timed to avoid the blades now active and jump up and grab the monkey swing. Swing as far forward and then left (south) to avoid the beetles below and drop back into the water. Swim down, left then up back to the air hole in the ceiling. Face west and swim forward past the first alcove on the right and turn right. Swim to the end of the corridor, turn left and a sharp left and down through the hole in the floor. Swim left, then left to the wall, then right. Follow the corridor and turn left into the opening in the north wall. Turn right, follow the corridor around and turn left into the opening in the south wall. Turn right, follow the corridor around and turn left into the opening in the north wall. Swim north, up and surface back outside. Pull out of the water and head to the north/west corner of the courtyard. Use crowbar on the door, drop into the hole in the floor. Quickly wade left (west) and pull up onto the block on the right before the flames along the slopes hit the water. Use the crowbar to pry off the Black Beetle from the wall. Take a standing jump to the flat section of the slope and angle to face north/east. Take a running jump to the ledge and pickup the small medipack. Take a standing jump to the other ledge and pickup the Shotgun ammo. Drop down and pull the jump switch, opening a way somewhere. Climb the block and take a running jump and grab (to change trajectory) to the alcove in the south wall, which has now converted the slope to blocks. Climb the blocks back up to the room above. Climb two blocks in the south/west corner into another room. Head to the small slope in the south/east corner and climb the block. Turn right and take a running jump and grab to the column ahead. Pull up, turn right and take a running jump to the slope. Jump off the slope and grab the ledge ahead. Pull up, turn right and take a standing jump and grab the block ahead. Pull up and use the crowbar to pry off the Black Beetle from the wall. Drop back into the hole in the floor and turn west to face the slope. From the middle of the block, take a standing jump and grab the edge of the slope and drop to the ground (minimal loss of life). Drop down into the hole in the floor and climb down the next block back into the previous room. Exit back into the outdoor courtyard. Head to the south/east corner of the courtyard, jump up and grab the reddish foliage on the block and climb up. Angle to face south/west and take a standing jump and grab the edge of the ledge ahead. Pull up and climb the reddish foliage on the south wall up to the ledge on the right. Take a running jump to the opening in the east wall. Navigate through the inner maze back to the wooden staircase and back outside the fortress. Climb down the stairs and exit through the gold door in the east wall. Arm weapons and shoot the golden harpie. Climb down the cliff and exit through the door on the left (north) back into the lava room. Take a running jump and grab the block in the middle of the lava and another to the ledge on the other side. Exit right through the crawlspace and light a flare. Turn right and head to the end of the corridor and climb the ladder. At the top, turn right and right again to the end of the corridor. Use the crowbar to pry off the last Black Beetle from the wall. Exit back to the ladder (left and left again). Head west, turn left, crawl through the crawlspace and re-enter the red lava room. Take a running jump and grab the block in the middle of the lava pit. Take another running jump and grab to the other side and exit via the door in the east wall. Climb back up the cliff and through the gold doors at the top. Climb the stairs back through the indoor maze to the exit (see map). Take a running jump to the ledge and climb the reddish foliage on the left down to the lower ledge. Angle to face north/east and take a standing jump to the lower block. Climb the foliage on the end of the block back down to the floor of the courtyard. Climb down the stairs in the north wall and place the four Black Beetles into the centre pyramid structure. Pickup the Mechanical Scarab and return to the stairs back to outside courtyard. Head to the south/east corner of the courtyard, jump up and grab the reddish foliage on the block and climb up. Angle to face south/west and take a standing jump and grab the edge of the ledge ahead. Pull up and climb the reddish foliage on the south wall up to the ledge on the right. Take a running jump to the bridge, combine the Winding Key and Mechanical Scarab and use it on the south tile to deactivate the spiked corridor. Head down the corridor, pickup the Mechanical Scarab and enter the next room. Walk over all four raised blocks and three Lara clones materialize. Do not shoot them as you will deplete your own life. Enter the new opening in the east wall. Take a running jump to the first slope and run forward. When the spiked boulder falls, sideflip right to the next slope. Immediately sideflip left to the previous slope and continue up. Repeat for the next two boulders and return to the bottom of the slope. Use the shotgun to shoot the skeleton into the deadly water. Drop into the corridor between the slopes and pickup the large medipack and Shotgun ammo. Climb the slope to the next room. Arm weapons and shoot the Minotaur Guardian. Enter the south/east area, shoot the chests and pickup the small medipack and Shotgun ammo. Climb the ladder in the east wall and backflip to the ledge behind. Pickup the Hathor Effigy and climb back down the ladder. Return to the room with the small pools and exit via the opened door in the north wall. Slide down the slope and exit the corridor. Turn left and up the wooden staircase back to the interior maze. Make your way back through the maze to the exit (see map). Take a running jump to the ledge ahead and another to the bridge. Head north and use the Mechanical Scarab on the tile to deactivate the spiked corrior and enter. Turn right, head down the corridor and turn left. Arm weapons and shoot the Minotaur Guardian. Climb the ladder on the south wall of the centre structure and pull up. Jump up and grab the jump switch and watch a cutscene of a graveyard. Head around the perimeter and pickup the Shotgun ammo. Return to the ladder and climb back down. Head east down the stairs into the graveyard. Pickup the flares on the grave to the left and shoot the two skeletons back into their graves (or wait until they're together and take both out with one explosive crossbow arrow). Secret #3: From the grave with the flares, drop into the hole, light a flare and enter into Secret #3. Pickup the Shotgun ammo and climb out. Head to the 2nd grave from the north/east corner, drop in and light a flare. Use the Mechanical Scarab to deactivate the spikes. Open the sarcophagus, pickup the Ornate Handle and climb out. 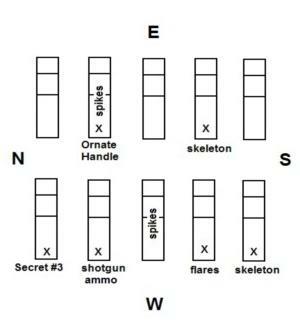 There are two pickups, Shotgun, flares and two skeletons in the remaining graves (see map). Exit the graveyard west and climb the stairs to the gold door. Combine the Ornate Handle and the Hathor Effigy and place the Portal Guardian in the pedestal. Head through the door, admire the treasure, climb the stairs to the throne and the level ends.